Aquaphor is a brand of products manufactured by Eucerin. Eucerin specializes in lotions, ointments and salves for the treatment of chapped, dry and irritated skin. The Aquaphor line contains a product specifically aimed at helping children, called Aquaphor Baby Healing Ointment. Aquaphor claims their Baby Healing Ointment is fragrance-free and preservative-free. This claim is true when the ingredients of the product are examined. With the exception of a natural oil with antimicrobial properties and a natural light fragrance, the product is free of preservatives and fragrances. Aquaphor also claims that the product is effective when used to relieve dry skin caused by atopic dermatitis and is pediatrician recommended. Aquaphor's website touts the product as a soothing, protective, healing solution for dry and irritated skin resulting from drooling, burns and abrasions. The manufacturer claims it is clinically proven to reduce the severity of diaper rash within six hours and is proven to reduce the overall healing time associated with minor injuries. The active ingredient in Aquaphor's Baby Healing Ointment is petrolatum. Petrolatum is a product approved by the United States Food and Drug Administration for use as a skin conditioner and protectant, according to the book “A Consumer's Dictionary Of Cosmetic Ingredients.” A byproduct of oil manufacture, petrolatum is also known as petroleum jelly. It repels moisture and is insoluble in water, forming a protective barrier over the skin when used in Aquaphor's Baby Healing Ointment. There are four moisturizers included as inactive ingredients in Aquaphor Baby Healing Ointment. Mineral oil is a byproduct of oil manufacture and is sometimes referred to as liquid petroleum. Lanolin alcohol is an emollient made from chemically altered lanolin, the greasy substance found in sheep's wool. “Milady's Dictionary of Skin Care and Cosmetic Ingredients” notes that lanolin alcohol is less likely to cause an allergic reaction in those with allergies to wool or lanolin. Glycerin attracts water to the skin and is water soluble. The fourth moisturizer included in Aquaphor Baby Healing Ointment is ceresin, a waxy substance used as a substitute for beeswax. Ceresin is made by bleaching and purifying the mineral ozocerite, a sandstone derivative. It is used as a moisturizer and skin protectant. Aquaphor Baby Healing Ointment also contains panthenol, the alcohol-based provitamin version of vitamin B5. Vitamin B5, according to the National Institutes of Health, has been used topically to provide relief to dry, chapped hands although further studies are needed to evaluate the efficacy of this use. Aquaphor Baby Healing Ointment contains bisabolol, an oily liquid that makes up the bulk of essential oils extracted from German chamomile. It is a noted anti-irritant, anti-inflammatory and antimicrobial substance, according to “Cosmetics Unmasked.” It is also used to impart a soft, gentle floral fragrance to the product. Aquaphor Baby Healing Ointment is touted as safe for external use anywhere on a baby's body. While this appears to be true based on the ingredients listed in the formula, use of the ointment around delicate mucous membranes, such as the eyes, ears, nose or mouth should be restricted. Avoid using Aquaphor baby healing ointment on your child's genital area. Although there are no cautions given by the manufacturer against this use, the occlusive nature of the ingredients has the potential to cause irritation. 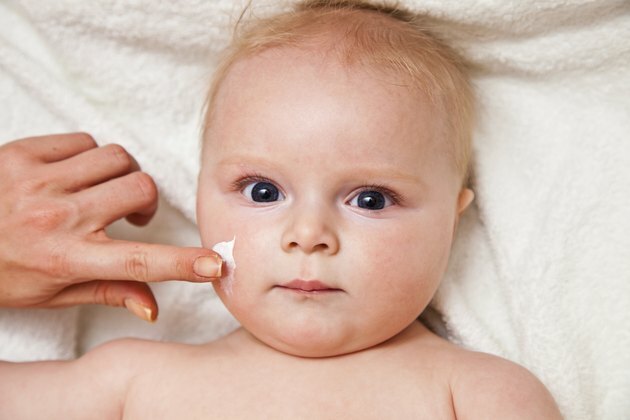 Speak to your child's pediatrician or dermatologist if you have concerns about the nature of your baby's skin or are experiencing severe problems or are encountering dry skin or diaper rash that does not cease. Although the manufacturer indicates the ointment for use on minor burns and abrasions, Aquaphor Baby Healing Ointment should not be used to treat major burns, puncture wounds or lacerations. If your child develops a rash, hives or a reaction to Aquaphor Baby Healing Ointment, discontinue use and seek the advice of a doctor immediately.